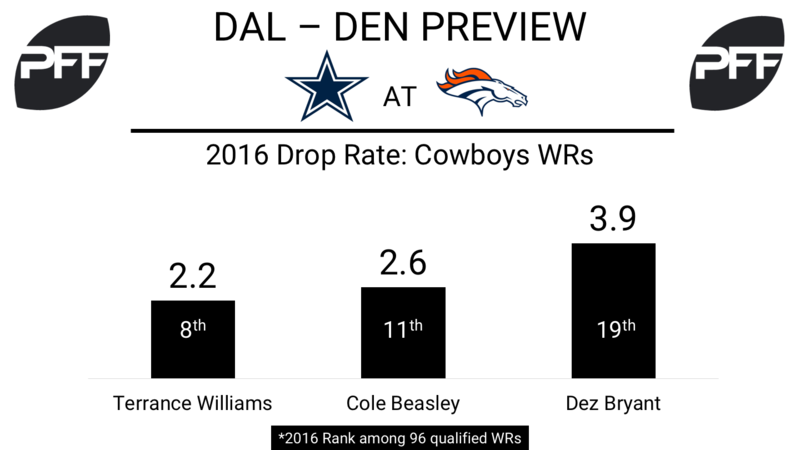 WR Cole Beasley vs. CB Chris Harris Jr. – Cole Beasley is one of the NFL’s most underrated receivers. Last year he finished with an overall grade of 86.1, which ranked 11th among wide receivers. He only dropped one pass all season long. Chris Harris has been the class of the NFL in terms of pass coverage for years – even out of the slot he proves as a dangerous weapon. Over his last 104 games he’s only given up eight touchdowns total. QB Dak Prescott vs. CB Aqib Talib – Prescott was simply accurate last year. He ranked tenth among quarterbacks with a 75.3 adjusted completion percentage. Interestingly, his receivers only dropped 2.8 percent of his passes, the second-best figure behind Marcus Mariota. Last season Talib had a career year, finishing with a 90.6 overall grade, ranked third among cornerbacks. He finally did not give up big plays as he had in years past. He was the only corner in the NFL (with enough qualifying snaps) to not allow a touchdown in 2016. RB Ezekiel Elliott vs. DI Adam Gotsis – In Week 1 Elliott picked up where he left off last year. He averaged 3.21 yards after contact per attempt and had a 77.4 elusive rating that ranked fourth in the NFL – all against a stingy Giants run game. Gotsis is a name you might not have heard before, the second-year player out of Georgia tech he played 31 of 58 defensive snaps, collecting 5 run stops, a team high. He ranked first in run stop percentage this week of players who had 11+ run snaps (36 percent). TE A.J. 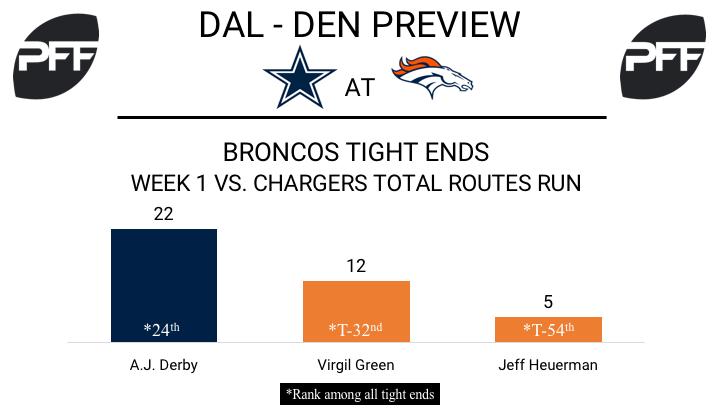 Derby vs. LB Sean Lee – Catching all three of his Week 1 targets for 34 yards, Derby earned a receiving grade of 78.9 Week 1, eighth highest among all tight ends. He played 29 total snaps last week, and ran a route on 22 of them (76%). Lee allowed three catches on three targets to rookie TE Evan Engram last week, though he held the tight end to just 13 yards. Lee finished 2016 with the sixth best coverage grade among all linebackers (85.2). T Menelik Watson vs. EDGE DeMarcus Lawrence – Watson allowed four sacks last week; no other tackle allowed more than two. He will have to be better this week for the Broncos to hold off Lawrence, who rushed from the left side on 100 percent of his snaps last week. Lawrence was the third most productive pass-rusher among 4-3 DEs with at least 10 pass-rush snaps, accumulating seven total pressures on 29 pass-rush snaps. WR Demaryius Thomas vs. CB Anthony Brown – Brown had a huge Week 1, allowing just one completion on four targets and getting his first interception of the season. He allowed a passer rating of 0.0 and earned the second best cornerback grade last week (90.4). Thomas will look to build on his slightly disappointing Week 1 where he earned a grade of 73.5 and produced a passer rating of 89.1 when targeted (his quarterback Trevor Siemian had a 94.2 rating last week).